Two days ago, human rights activist, Deji Adeyanju resigned from the ‘Our Mumu Don Do’ coalition, alleging that his partner, Charles Oputa, aka Charly Boy, betrayed him and their cause while he was locked up for 78 days in prison. (Read HERE). 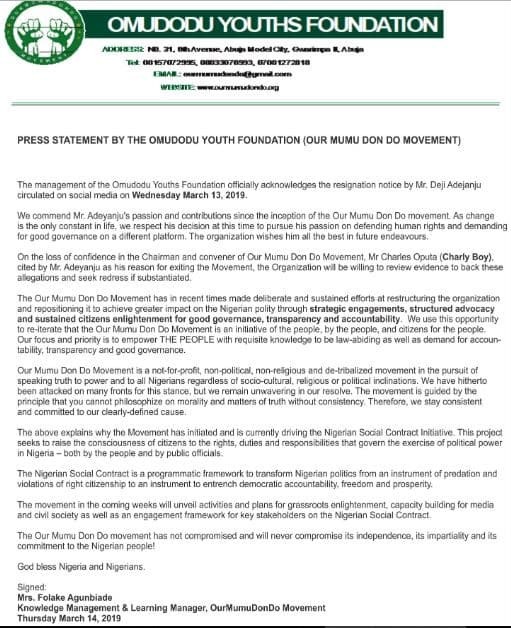 Reacting to his resignation and allegation against Charly Boy, the movement issued a statement today saying, ‘the management of the Omudodu Youths Foundation officially acknowledges the resignation notice by Mr. Deji Adejanju circulated on social media on Wednesday March 13, 2019’. ‘On the loss of confidence in the Chairman and Convener of Our Mumu Don Do Movement, Mr Charles Oputa (Charly Boy), cited by Mr. Adeyanju as his reason for exiting the Organization, we will be willing to review evidence to back these allegations and seek redress if substantiated’.